With 9.18 million active diners, almost 300K daily orders, 75K restaurant partners, and presence in over 1,100 cities across the US & the UK, Grubhub is undeniably one of the most impactful online food ordering & delivery platforms today. Being one of the pioneers of the online food ordering industry, not only has Grubhub simplified food ordering for millions of people, but has also paved the way for the next generation of food ordering websites across the globe. Besides these impressive growth stats, Grubhub’s merger with its competitor Seamless, its IPO, and recent acquisition of Yelp’s Eat24 have turned out to be very smart moves, which have played a crucial role not only in the success of the company, but of the entire industry. 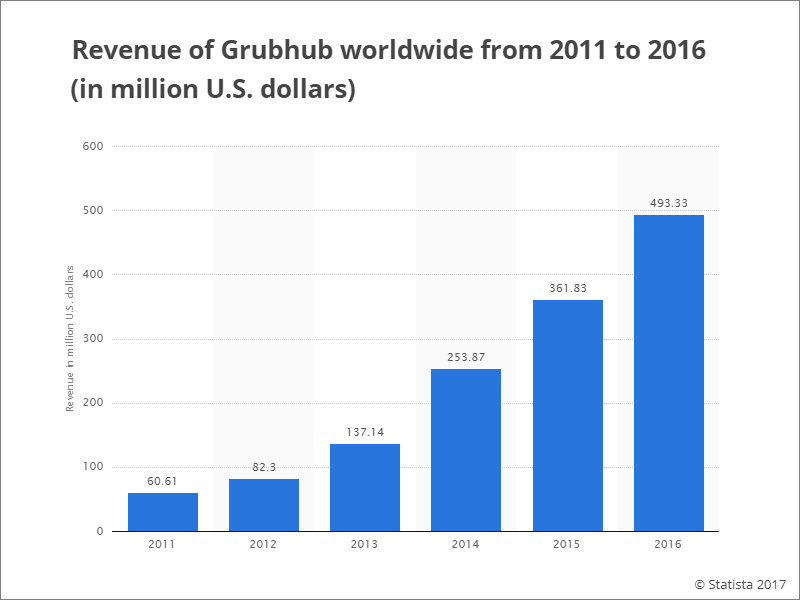 Here is the success story of Grubhub that depicts how the company has enjoyed continuous growth over the years by making right decisions at each stage (from ideation to expansion) and in regard to key business operations. Not only is it worthwhile for online food ordering startups, but for the entire startup ecosystem. Let’s get started. Matt Maloney & Mike Evans launched Grubhub in 2004 after experiencing the lack of a streamlined dinner ordering service, which wouldn’t require them to call restaurants to ask for menu and then read their credit cards & address to place the order. Back then, they were working on a rental real estate search website, instantly realized that there can be similar service for restaurants. So they began collecting menus across Chicago, and Mike wrote the initial site code, and Grubhub was live (in Chicago). The first takeaway here is pretty straightforward – build something to solve a problem; or if a solution already exists (phone ordering), then enhance it (online ordering). To train your brain for such kind of thinking, I highly recommend you to read Zero to One: Notes on Startups by Peter Thiel. The second takeaway is that entrepreneurs must learn cross usage of growth agents across industries, which is essentially what Matt & Mike did with the idea of online real estate listing. The practice doesn’t have a standard name yet, but recently Elon Musk referred it as ‘cross-fertilization’, when SpaceX ’s technology was used at Tesla for better operational efficiency. Matt & Mike didn’t start with the commission-based (now a time-tested one) revenue model for Grubhub; instead, they offered restaurants a premium placement on their marketplace website, and charged $140 for 6 months. But soon enough they realized that this idea wasn’t clicking with restaurants; so, they brainstormed a little & decided to implement a commission-based model (10% commission on each order), which till date has proven effective for the company. Revenue model plays a major role in deciding the fate of startup. Therefore, entrepreneurs must thoroughly understand the market to pick the most fitting revenue model for their business idea. Additionally, to maintain profit margins they should use additional revenue streams (such as display ads) in conjunction to the primary revenue channel. Once Grubhub became a hit in the local Chicago market, it was time to take it to other US cities. But Grubhub, still in its nascent stage, didn’t have sufficient funds for an expansion. So, the team tried approaching some venture capitalists. Although most VCs didn’t say no to their idea, they didn’t fund it either. The founder duo was aware that time is more precious than money (as the idea was already out for copycats), so, decided to bootstrap their expansion to San Francisco. The move, though a bit risky, played in Grubhub’s favor and also got them their first funding one month later. Acquiring funds are crucial for startups, but they shouldn’t solely rely on it. Entrepreneurs must learn to interpret time’s value into money & act accordingly. Basically, money is important but your conviction comes first. For instance, here at FATbit, we run an initiative called YoSuccess, where we feature successful early-stage startups from across the world. More than 80% of the startups listed on YoSuccess are bootstrapped. Grubhub entered the San Francisco market in October 2007, and their bold move of a self-funded expansion was undoubtedly inspiring. However, how they approached it brings a different lesson altogether for startups. From the start, Grubhub team was aware that expansion to a new market will be difficult. Not just because of the lack of funds, but also because they were not locals there (like in the case of Chicago). And online food delivery, being a hyperlocal business, requires extensive local market knowledge for apt execution. So, they hired a location manager for San Francisco, who physically went to restaurants to sign them up for Grubhub and bit-by-bit built company’s network there. Every market is distinct; so what works in your native market won’t necessarily work in others. So, before entering a market, entrepreneurs must analyze the unique nature of the new markets, and execute their expansion plan accordingly. Also Read: How to Ensure That Your Product Gets Adopted by Masses? One of the major reasons behind Grubhub’s successful expansion to San Francisco was their effort in offline marketing (such as posters/banners at transit hubs, buses, subways, where their prime target audience is bound to pass through). And over the years, this approach has paid them well. They know that offline advertising can work well for their business, thus, distribute their marketing efforts between online & offline channels aptly, instead of just focusing online, like most startups do these days. Grubhub has also kept a keen eye on its competitors, especially Seamless (now a partner), which was doing pretty well in New York in early 2010s. Grubhub closely studied Seamless’s efforts towards product enhancement & marketing, and implemented similar strategies for its own growth. Don’t be a part of the rat race. Understand the nature of your business and decide which marketing channels would be most beneficial. Also, spend some time & effort in competitor research, learn how they are progressing, and map out sounder product enhancement & marketing strategies for yourself. Since its inception in 2004, Grubhub has constantly worked towards improving its technology to provide better customer experience. For instance, in 2010, after observing a rapid shift towards mobile, the company launched its mobile app, quite timely. Around the same time, Grubhub also sensed the need of a tablet app for restaurants, in order to help them manage the bulk of orders they were receiving from the website (for the same reasons we also recently launched restaurant & delivery boy mobile apps for our food ordering portal builder YoYumm). Besides confirming and completing orders, the app also allowed restaurateurs to update menus, business hours, etc. Overall, for their restaurant partners, it was a very welcoming technology-enabled change, which down the line aided in company’s growth. Updating your business with latest technology is crucial. 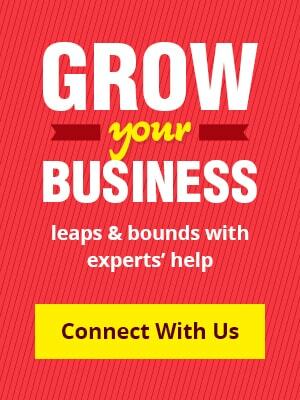 Entrepreneurs must keenly observe and also anticipate customers’ needs and then ponder upon how the latest technological advancements can be used to address those needs in the most satisfactory manner. Looking for an advanced technology solution for your food ordering startup? While most ecommerce businesses trumpet about expedite 2-day or next-day shipping, Grubhub and other food ordering & delivery platforms have to deal with customers who expect their orders to deliver within the same hour or so. To ensure that 60 minutes, Grubhub has hundreds of customer care executives at their Chicago headquarters & automation tools to manage orders & delivery across the US. If the order isn’t confirmed within 5 minutes or if it is not out for delivery in 20 minutes – the company proactively sees what’s wrong and fixes it to ensure customer experience isn’t hampered. The ultimate key to the success for a business is to deliver exceptional experience to customers. For that continuous investment in customer services is of utmost importance, whether it is by integrating new technology solutions (like automation) or by building processes that proactively solve common problems faced by customers. All the success that Grubhub has gained over the years is primarily attributed to their approach of never stopping to explore new territories to improve their offerings. Its delivery service for restaurants that don’t offer their own delivery, hiring of independent delivery contractors, and recent acquisition of Eat24 (after which Grubhub has a hold on 50% of the US market); are all examples of this never-stop-improving approach. Grubhub success story is lesson for every entrepreneur & business enthusiast that teaches how through moving ahead step by step with conviction, perseverance, and focus on consumers help startups in achieving heights they dream of. Posted in Web Based Business Models, eCommerce, Tech News and tagged as online food ordering system, Online Food Ordering Solution, Grubhub by FATbit Chef.